Rather unfamiliar with Paintball, I have been receiving quite the education from my oldest son who is completely enthralled with this sport. 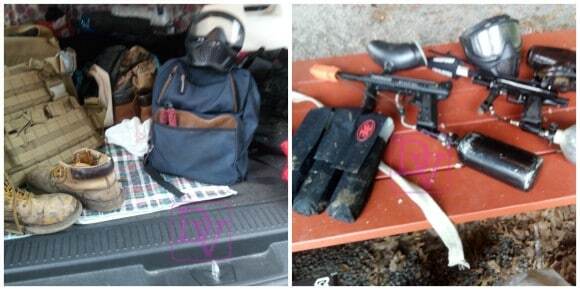 Paintball is something he simply can’t get enough of and he and his friends travel out to Three Rivers Paintball Park quite frequently to indulge in their passion. Think back to Sarah Jessica Parker splatting pink paint all over her opponents in “Failure To Launch”, that was probably one of the best advertisements for the sport I have seen. The fun on the course looked never-ending and of course, male, female it really does not have a gender that it favors, but you do have to like to compete! 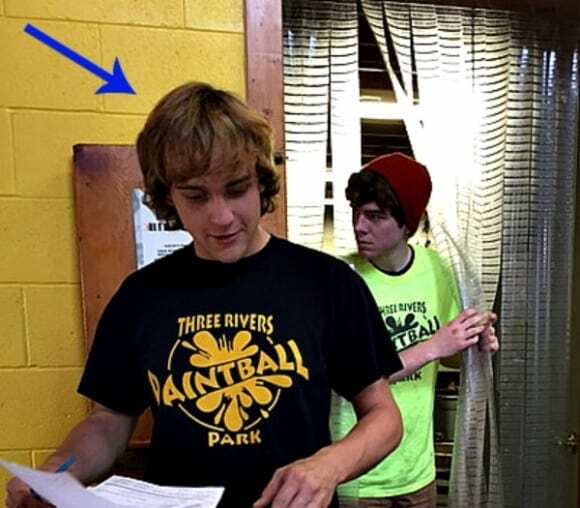 My son MJ has provided me a few fun facts about his favorite local Paintball place, Three Rivers Paintball Park where he has learned to seize the moment, be a good sport and take a tumble in order to dodge that S-P-L-A-T. Don’t worry if you have bee allergies and need an EPI Pen either, the whole staff is trained on how to help treat those pesky bee stings. Lavishly live life out loud with a bit of paintball mayhem at Three Rivers Paintball Park. It’s soon to be a better-than-normal Saturday morning as my son’s are getting their gear packed up to travel out to Three Rivers Paintball. 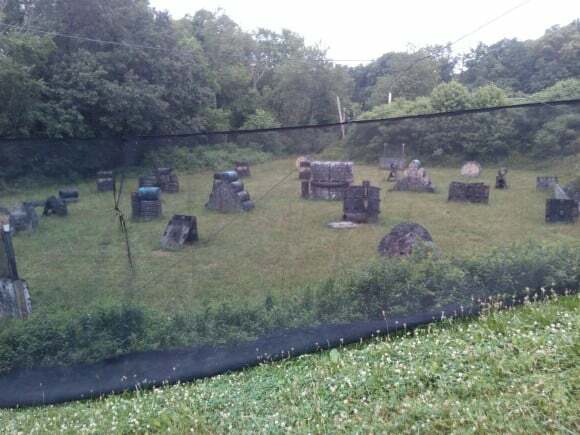 If you are not familiar with this fun Paintball location, it is located on Rochester Road, in Freedom, PA, pretty much 20 minutes North Of Pittsburgh. As a busy mom, I want to share this little piece of precious information with you: very close by, about 3 miles away from Three Rivers Paintball Park is shopping paradise, with almost every kind of retailers and food place you might want to indulge in. I mention this because if your kids want to play paintball, and you have to drive them, you can have a great day as well while they play. Our particular game-play was from 12-5 so I had plenty of time to do what I needed to do and then return. 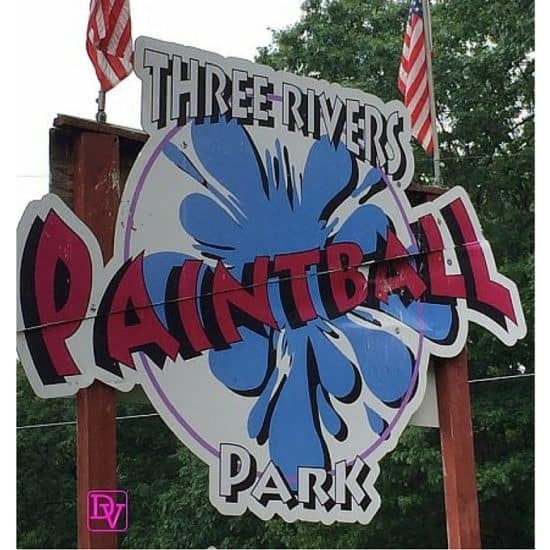 Here’s a little bit about their day at Three Rivers Paintball Park, so you can see the facility and meet some of the staff. Phil greeted us when we got there and made sure that our crew was set to play for the day. 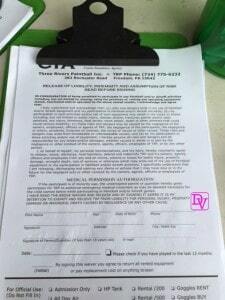 Your biggest responsibility it signing the waiver’s or having the kids bring them signed if you are bringing a car full of kids. These are very easy to fill in and you have to hand them over before you can play. Once you get this filled out, it’s pretty much GAME ON. 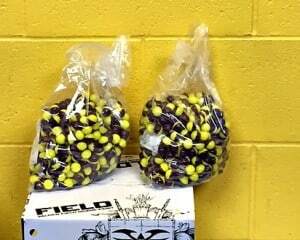 You will receive your paintballs, see this bag, this is where the fun is, lol! My one son rented equipment because it was his first time and he did not have the equipment but since he could rent it, he was able to play too and I might add he was dying to go play with his brother, take a look. The next stop was under the pavilion, where they would get dressed, set up their snacks(you can bring food, beverages, whatever you want to make it a really fun day). I packed them plenty of food, beverages and snacks, they got dressed and the refs headed on down to be with them and go over rules and make sure that everyone knew what to do! 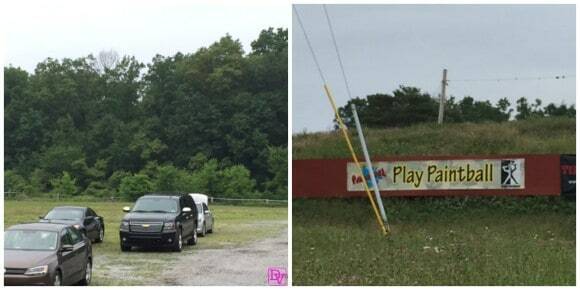 Play happens on the 70 acres at Three Rivers Paintball, rain, sun, or snow(call for details). 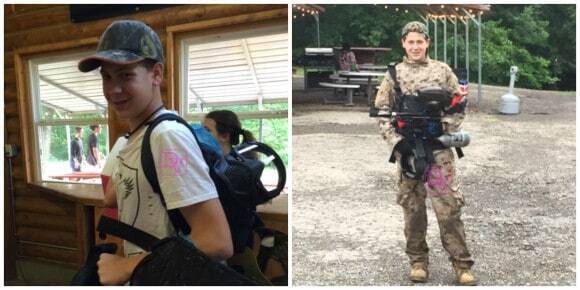 Here’s an important Piece of Information about ALLERGIES and EPI PENS while at Three Rivers Paintball Park: as you know my one son has SEVERE allergies and one of these includes a life-threatening reaction, with minimal reaction time to BEE STINGS. My son is deathly allergic. 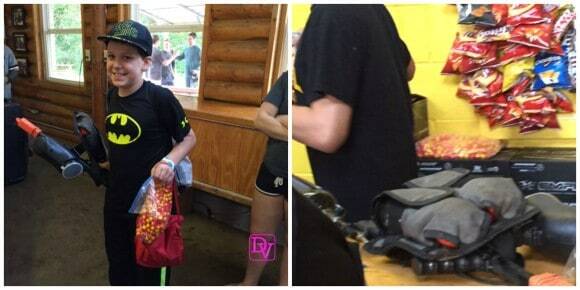 We did not let this stop his fun, in fact, what we found out was kind of amazing… Phil and the staff at Three Rivers Paintball are ALL trained on how to use EPI Pens and in fact they even have one there just in case!!!! The ref(Tyler) that went out with my kids knew about my son’s allergy(we always communicate) and he made sure to check on him which was probably the coolest thing ANYONE Has ever done for us, and it also says a lot about the staff here. This is an outdoor sport, and they are prepared for whatever might happen and I can not be more grateful for this! Parties can happen at the same time public play is going on, as Three Rivers Paintball is huge, and can hold a lot of you. There are scenario days and my son has participated in those and had lots of fun as well. No paintball match is ever the same as there are always different people playing which keeps the challenge and the play lots of fun. Here’s the look of a child who is so happy before and after, this is basically a priceless sport. The kids are outside(there are adults too, just BIG kids) and they are active, not sitting behind a smartphone nor behind a PlayStation or WiiU, your kids will be active and having fun like mine! Don’t worry about not having the equipment you can rent it, just dress with at least long pants for the great outdoors, some thorn bushes, grass-covered fields and loads of fun. Bees, they might be there, but the staff at Three Rivers Paintball Park are trained and ready to handle bee sting allergies too, so nothing is going to stand in the way of having fun! Lavishly live life out loud, play Paintball at Three Rivers Paintball Park, and get those kids(adults and kids alike) out of the house, onto the field and having a Splatting great time. This is a very informative post, thanks for sharing! It is good they have a huge parking space. I find it really troublesome to go to venues with very limited space. One of two things could have happened here Edwina. first balls could have jammed the cyclone. That would just needs to be cleared, remember nothing stops a true gamer during Paintball. Next, the other thing you could have experienced wherever YOU Played paintball, was a dead battery. The fix is an oh so simple … battery change! Hope that helps, IT’s game on, and paintball splattering away! Enjoy.. Glad you found my article on paintball interesting. Thanks Devnto for great answer.